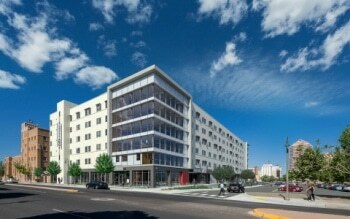 Signet Development officially broke ground this week on a 160,000 square foot, $35 million six-story building in Albuquerque, New Mexico, that will house University of New Mexico (UNM) students studying in entrepreneurial education programs. Called Lobo Rainforest, the project represents the first phase of Innovate ABQ, located in the planned innovation district in downtown Albuquerque. The project is scheduled for completion in August 2017. In addition to UNM, key project team members include Dekker/Perich/Sabatini architects and Jaynes Companies’ construction group. Signet will own and develop the facility through a lease arrangement with UNM, who will manage and operate the facility. Along with student apartments, the facility will be home to UNM’s Innovation Academy and several business startup organizations working to develop the university’s technologies, including Innovate New Mexico and STC.UNM’s Joseph L. Cecchi VentureLab business incubator. Other tenants will include the Air Force Research Laboratory and various retail outlets. The project provides students and the wider community with meeting rooms, collaboration spaces and a café, as well as access to cutting-edge equipment and technology. The residence portion of facility will house over 300 students. Signet Development, which has decades of experience in student housing projects, opened doors on another innovation project with the University of Florida in Gainesville last year.